Our main Open Spaces ride is on the 2nd Sunday of each month (see 2018 dates below), where as many as 30 local people may turn up for a sociable cycle ride lasting 4-5 hours and covering 15 -20 miles at a gentle pace. Due to the popularity of our rides we now run right throughout the winter. See below for more information. We also have a much shorter ‘Newcomers ride’ on the 3rd Sunday each month which is aimed at those new to cycling. Click here for further information on our Newcomers Rides. We sometimes run additional rides – see our special events page for more details. 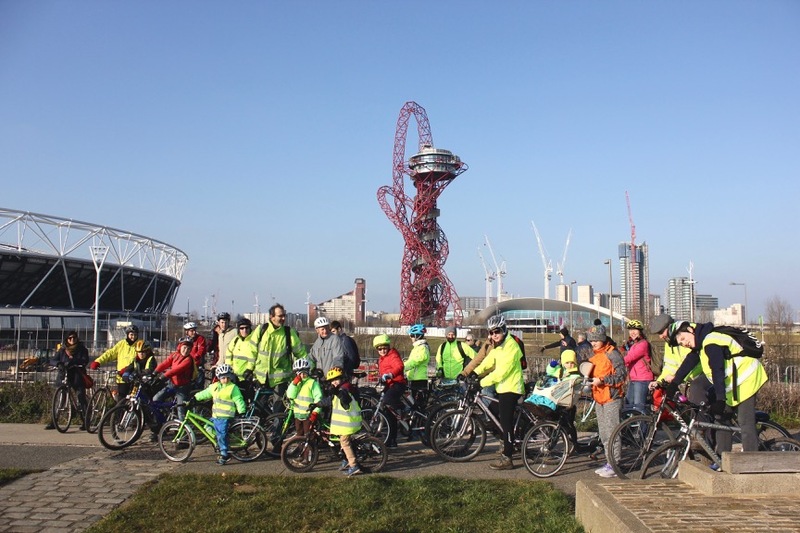 Our aim is for a relaxed and enjoyable afternoon travelling by bicycle and exploring the nooks and crannies in and around our borough of Waltham Forest. Frisbees sometimes materialise when we hit a suitably inviting open space. Our pace is easy, and we usually do around 15 miles there and back. We will do our best to tailor our route to the abilities of those who turn up, so the distance we cover might be considerably shorter. We keep together as a group and ‘top and tail’ the ride with marshalls – an experienced ride leader at the front, an expert marshall at the back to keep cars out of our convoy, and we have a mix of more confident adult riders and marshalls on the right hand side to act as a buffer zone. When on busier residential streets or urban roads we cluster together to form a tighter bike bus which is pretty much impenetrable by cars. When crossing busy junctions we block motor traffic from both directions to ensure safe passage across by our riders. We plan to stop off at a cafe at about half time, but we recommend you bring a snack and some water (to cover the unlikely event our plans are thwarted or if you have young people who need frequent refuelling). Plus of course a bicycle, and any children you can round up. In the winter months, please remember your lights. Everyone is welcome, so encourage your family & friends to join us. Note that this is a family friendly event, but you don’t need to turn up with anyone else. This ride is free, and no need to book… just turn up. Click here to download a flyer you can print and give to people who may want to join us. We have been running these rides since 2005. You can see some of our routes here: http://www.bikely.com/listpaths then search for “walthamstow”. At 1pm on the 2nd Sunday of each month; we aim to get back around 5pm, but we often extend to 6pm in the summer months. We start our rides at the Orford Road/Church Lane junction, Walthamstow Village, E17 9RW, next to the old postbox opposite the Ancient House… see the map. 2019: 13 January, 10 February, 10 March, 14 April, 12 May, 9 June, 14 July, 11 August, 8 September, 13 October, 10 November, 8 December. Cancellations? We’ve never had one yet! Sometimes when poor weather is forecast people contact us just before a ride asking if its going ahead. So you need to know we have never cancelled one due to adverse weather conditions… we’ll be there whatever the weather. The only possible circumstance for us doing so would be where the authorities had advised the general public against venturing outside (eg due to extreme weather conditions), or if all of our ride leaders were unexpectedly indisposed. We’ve been running monthly rides since 2005. We are thankful for the support of the Hoe Street Community Ward Forum which in 2016 awarded £120 for the purchase of tabards & flags. Why “family”? it’s rather off-putting….. I think ‘family’ makes our rides sound more accessible and supported to those (including families with younger children) who might otherwise be scared off assuming that (like some clubs) we do 50 or 100 mile round trips at speed. Why not try one of our rides .. and if you are put off by the event, by all means tell me why and suggest what I can do about it. HI I came to a bike ride earlier in the year without any family but was made to feel welcome. I went along because I had only just started to cycle again and did not want to go on a ride that was too demanding. Will definitely go to another one. I note that you will be holding a family friendly bike ride on Sunday 13th April. Meeting outside the Ancient House in Walthamstow village at 1pm they will explore parks and back street routes. You should see the LBWF publication “Byelaws for pleasure grounds, public walks and open spaces within the borough”, para 3 et seq of which forbids the riding of bicycles in parks. I was not aware of the publication. Where did you find it – is it online anywhere? We are careful about only riding where permitted in parks (ie abiding with any no-cycling signage which is displayed in parks), but it sounds like we need to review this with the council, perhaps as part of the mini Holland proposals. It’s on the WF council website. Just search “parks”, it’s a .pdf file. – a well meaning individual? – someone worth too much time on their hands? – or perhaps a combination of all of the above? Just the first one, Rob! Plus, I’m fed up with cyclists illegally riding through my park and almost running me over! Does that answer your multi-question post? If she is unable to ride a bike at all then she will first need some training. This is provided free for Waltham Forest residents by Cycle Confident – you can get in touch with them here: https://www.cycleconfident.com/, or phone 02030316730. Once she has basic balancing & stopping skills she is very welcome to join our Newcomers Ride.